In the late 19th century, Louis Cartier discovered the valuable metallic properties of platinum and began using it for setting Cartier’s incredible diamonds and gemstones. Platinum is a rare precious metal found primarily in South Africa and Russia. Not only is it rare, its specific metallic properties are also unique. Platinum is very ductile, one-ounce can produce a wire which measures a mile long and it is so pure that when worn it’s completely hypoallergenic. The metallic properties, which make platinum perfect for jewelry use, are high tensile strength and durability—a secure way for setting precious stones. Platinum’s greyish white luster will never fade and when scratched the metal will not wear away as gold, therefore the jewelry can last forever. Intricate designs can be created from platinum because of the strength and durability as opposed to gold or silver, which have softer metallic properties. Platinum is alloyed with other metals, 95% pure platinum when it is used for jewelry will be hallmarked with Pt. 950 in a diamond shaped logo. 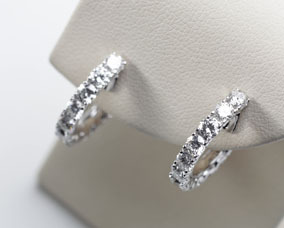 1.30ct diamond hoop earrings.